Home Uncategorized How are Spark Plugs made ? How are Spark Plugs made ? A spark plug is made of a center electrode, an insulator, a metal casing or shell, and a side electrode (also called a ground electrode). The center electrode is a thick metal wire that lies lengthwise within the plug and conducts electricity from the ignition cable hooked to one end of the plug to the electrode gap at the other end. The insulator is a ceramic casing that surrounds much of the center electrode; both the upper and lower portions of the center electrode remain exposed. The metal casing or shell is a hexagon-shaped shell with threads, which allow the spark plug to be installed into a tapped socket in the engine cylinder head. The side electrode is a short, thick wire made of nickel alloy that is connected to the metal shell and extends toward the center electrode. The tips of the side and center electrodes are about 0.020 – 0.080 inch apart from each other (depending on the type of engine), creating the gap for the spark to jump across. The several hundred types of spark plugs available cover a variety of intimal-combustion engine-driven transportation, work, and pleasure vehicles. Spark plugs are used in automobiles, trucks, buses, tractors, boats (inboard and outboard), aircraft, motorcycles, scooters, industrial and oil field engines, oil burners, power mowers and chain saws. Turbine igniters, a type of spark plug, help power the jet engines in most large commercial aircraft today while glow- plugs are used in diesel engine applications. The heat range or rating of a spark plug refers to its thermal characteristics. It is the measure of how long it takes heat to be removed from the tip of the plug, the firing end, and transferred to the engine cylinder head. At the time of the spark, if the plug tip temperature is too cold, carbon, oil, and combustion products can cause the plug to “foul out” or fail. If the plug tip temperature is too hot, preignition occurs, the center electrode bums, and the piston may be damaged. Heat range is changed by altering the length of the insulator nose, depending on the type of engine, the load on the engine, the type of fuel, and other factors. 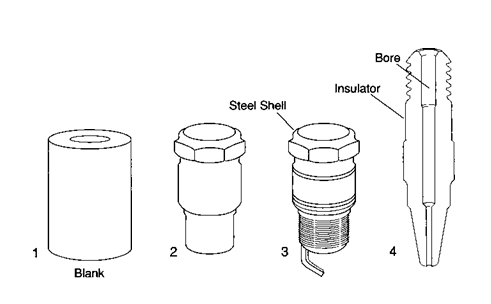 For a “hot” plug, an insulator with a long conical nose is used; for a “cold” plug, a short-nosed insulator is used. Spark plugs are under constant chemical, thermal, physical, and electrical attack by corrosive gases at 4,500 degrees Fahrenheit, crushing pressures of 2,000 pounds per square inch (PSI), and electrical discharges of up to 18,000 volts. This unrelenting assault under the hood of a typical automobile occurs dozens of times per second and over a million times in a day’s worth of driving. The spark plug evolved with the internal combustion engine, but the earliest demonstration of the use of an electric spark to ignite a fuel-air mixture was in 1777. In that year, Alessandro Volta loaded a toy pistol with a mixture of marsh gas and air, corked the muzzle, and ignited the charge with a spark from a Leyden jar. In 1860, French engineer Jean Lenoir created what most closely resembles the spark plug of today. He combined an insulator, electrodes, and spark gap in a single unit. As part of his patent application for the internal combustion engine that year, he devoted one sentence to describing the spark plug. He refined this spark plug in 1885. In the early 1900s, Robert and Frank Stranahan, brothers and partners in an automobile parts importing business, set out to produce a more efficient and durable spark plug. They added gaskets between the metal shell and porcelain insulator, made manufacturing easier, and reduced the possibility of gas leakage past the gaskets. In 1909, Robert Stranahan sold the plug to one automobile manufacturer and went into the spark plug manufacturing business, cornering the market at that time. The industry exploded as the age of the automobile opened. Eventually, variations in ignition systems, fuel, and performance requirements placed new demands on spark plugs. Although the basic design and function of the plug has changed little since its inception, a staggering variety and number of electrode and insulator materials have been tried. The electrodes in a spark plug typically consist of high-nickel alloys, while the insulator is generally made of aluminum oxide ceramic and the shell is made of steel wire. Selection of materials for both the electrodes and the insulator have consumed much research and development time and cost. One major spark plug manufacturer claims to have tested 2,000 electrode materials and over 25,000 insulator combinations. As electrodes erode, the gap between them widens, and it takes more voltage than the ignition system can provide to fire them. High-nickel alloys have been improved and thicker electrodes have been used to reduce engine performance loss. In addition, precious and exotic metals are increasingly being used by manufacturers. Many modem plugs feature silver, gold, and platinum in the electrodes, not to mention center electrodes with copper cores. Silver has superior thermal conductivity over other electrode metals, while platinum has excellent corrosion resistance. Insulator material also can have a dramatic effect on spark plug performance. Research continues to find a material that better reduces flashover, or electrical leakage, from the plug’s terminal to the shell. The breakthrough use of Sillimanite, a material that is found in a natural state and also produced artificially, has been succeeded by the use of more heat-resistant aluminum oxide ceramics, the composition of which are manufacturers’ secrets. One major manufacturer’s process for making the insulator involves wet grinding batches of ceramic pellets in ball mills, under carefully controlled conditions. Definite size and shape of the pellets produce the free- flowing substance needed to make a quality insulator. The pellets are obtained through a rigid spray-drying operation that removes the water from the ceramic mixture, until it is ready for pouring into molds. Each major element of the spark plug—the center electrode, the side electrode, the insulator, and the shell—is manufactured in a continuous in-line assembly process. Then, the side electrode is attached to the shell and the center electrode is fitted inside the insulator. Finally, the major parts are assembled into a single unit. 1 The one-piece spark plug shells can be made in several ways. When solid steel wire is used, the steel can be cold-formed, whereby coils of steel are formed and molded at relatively low temperatures. Or, the steel can be extruded, a process in which the metal is heated and then pushed through a shaped orifice (called a die) to produce the proper hollow shape. Shells can also be made from bars of steel that are fed into automatic screw machines. These machines completely form the shell, drill the hole through it, and ream it—a process that improves the finish of the drilled hole and makes the size of the hole more exact. 2 The formed or extruded shells—called blanks until they’re molded into their final shapes—require secondary operations to be performed on them, such as machining and knurling. Knurling a shell blank involves passing it through hard, patterned rollers, which form a series of ridges on the outside of the blank. Similarly, machining-—in which machine tools cut into the exterior of the shell blank—generates shapes and contours on the outside of the shell. The shells are now in their final shape and are complete except for threads and side electrodes. 3 The side electrode is made of a nickel alloy wire, which is fed from rolls into an electric welder, straightened, and welded to the shell. It is then cut to the proper length. Finally, the side electrode is given a partial bend; it is given its final bend after the rest of the plug assembly is in place. 4 The threads are then rolled on the shells. Now complete, the shells are usually given a permanent and protective silvery finish by an electrolytic process. In this process, the shell is placed in a solution of acids, salts, or alkalis, and an electrical current is passed through the solution. The result is a thin metal coating applied evenly over the shell. 5 Insulators are supplied from stock storage. Ceramic material for the insulator in liquid form is first poured into rubber molds. Special presses automatically apply hydraulic pressure to produce unfired insulator blanks. The dimensions of the bore—the hollow part of the insulator—into which the center electrodes will be pressed are rigidly controlled. 6 Special contour grinding machines give the pressed insulator blanks their final exterior shape before the insulators are fired in a tunnel kiln to temperatures in excess of 2,700 degrees Fahrenheit. The computer-controlled process produces insulators that are uniformly strong, dense, and resistive to moisture. The insulators may be fired again after identifying marks and a glaze are applied. 7 The nickel alloy center electrode is first electrically welded to the basic steel terminal stud, a narrow metal wire that runs from the middle of the plug to the lower end (the opposite end from the electrode gap). 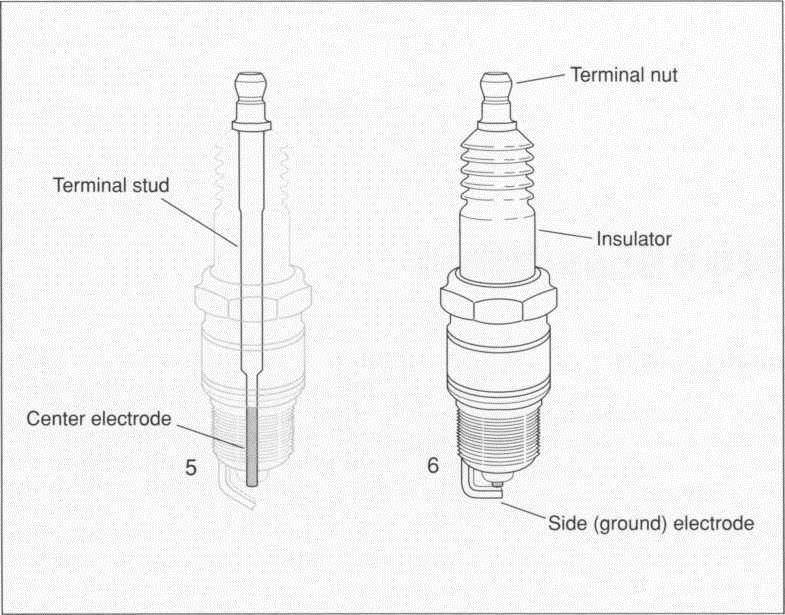 The terminal stud is attached to a nut, which in turn is attached to the ignition cable that supplies the electric current to the plug. 8 The center electrode/terminal stud assembly is sealed into the insulator and tamped under extreme pressure. Insulator assemblies are then sealed in the metal shell under 6,000 pounds pressure. After reaming to correct depth and angle, the rim or edge of the shell—called the flange—is bent or crimped to complete a gas-tight seal. Spark plug gaskets from stock are crimped over the plug body so that they won’t fall off. 9 To form the proper gap between the two electrodes, the center electrode of the now completely assembled spark plug is machine-trimmed to specifications, and the ground electrode is given a final bend. After a final inspection, the spark plugs are placed in open cartons that have been automatically formed. The plugs are generally wrapped in plastic film, placed first in a carton, and then prepared for shipping in quantity to users. Inspections and measurements are performed throughout the manufacturing and assembly operations. Both incoming parts and tooling are inspected for accuracy. New gauges are set up for use in production while other gauges are changed and calibrated. Detailed inspections of shells from each machine are constantly made for visible flaws. The ceramic insulator contour can be checked by projecting its silhouette onto a screen at a magnification of 20 times actual size and matching the silhouette to tolerance lines. In addition, regular statistical inspections can be made on insulators coming off the production line. insulator. Visual inspections assure that assembly is in accordance with design specifications. Heywood, John. Internal Combustion Engine Fundamentals. McGraw-Hill, 1988. Schwaller, Anthony. Motor Automotive Mechanics. Delmar Publishers, 1988. Davis, Marian. “Fire in the Hole: Spark-plug Design Heats up with New High-tech Materials and Design Concepts.” Hot Rod. February, 1990. “Spark Plug ‘Sees’ Inside Engines.” Design News. October 17, 1989. “Hot Spark Basics.” Popular Mechanics. May, 1989.